Vicki Wysocki received her BS in Chemistry at Western Kentucky University in 1982 and her PhD in Chemistry at Purdue University in 1987. After doing postdoctoral work at Purdue and at the Naval Research Laboratory, she joined Virginia Commonwealth University as an Assistant Professor in 1990. She was promoted to Associate Professor in 1994. Vicki joined the University of Arizona in 1996 and was promoted to Professor in 2000. Most recently she was Chair of the Department of Chemistry and Biochemistry at Arizona. 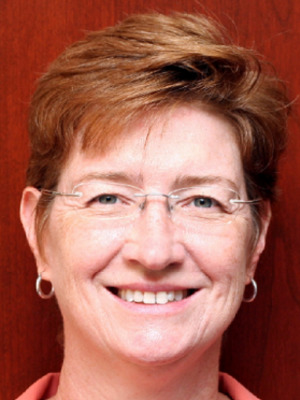 Vicki joined OSU in August 2012 as an Ohio Eminent Scholar. Research in the Wysocki group is separated into three broad areas: (1) determination of peptide dissociation mechanisms as a means for improving programs used for automated sequencing of peptides and proteins, (2) biomarker discovery for foreign organism detection, and disease diagnosis using proteomics methods, and (3) implementation of surface-induced dissociation onto commercial time-of-flight instruments. The related projects are designed to increase the current understanding of the fragmentation patterns of activated protonated peptides with particular interest on the formation and fragmentation of isobaric “b” ion structures. The long range goals of this work are to provide additional "rules" that will increase the confidence in automated primary sequencing of peptides and proteins by tandem mass spectrometry and, ultimately, to relate information on gas-phase fragmentation patterns and energetics of dissociation to the gas-phase conformations of intact and fragment peptides and proteins. The second major area of research is proteomics analysis of difference disease systems for protein biomarkers. The area of research ranges from finding markers that indicate diseases such as COPD and hypertension, to detecting invasive fungal and bacterial proteins in various organs of host organisms. Expansion of this topic include affinity capture of the protein biomarkers in interest, and de novo sequencing of hemoglobin in ticks in attempt to identify original source of blood for disease control. Subunit organization of protein complexes can be studied with tandem mass spectrometry by disruption of the quaternary structure in a controlled manner. The major challenge of using this method for structural analysis of non-covalent protein complexes is to overcome the undesired unfolding of subunits that occurs in the commonly used collision activation with gasous targets, which results in loss of information on the original conformation. Our custom surface induced dissociation (SID) device has shown promising results of revealing sub-architecutre of protein complexes with minimal unfolding. A third area of research is the development of SID device for improved structural characterization of large protein complexes. Please refer to the Wysocki Group Website for more detailed descriptions about the ongoing research projects. Click here for the current publications list.